Elai vada| Ilai vadam, is a variety of vadam which is generally made in summer season and stored for a year. 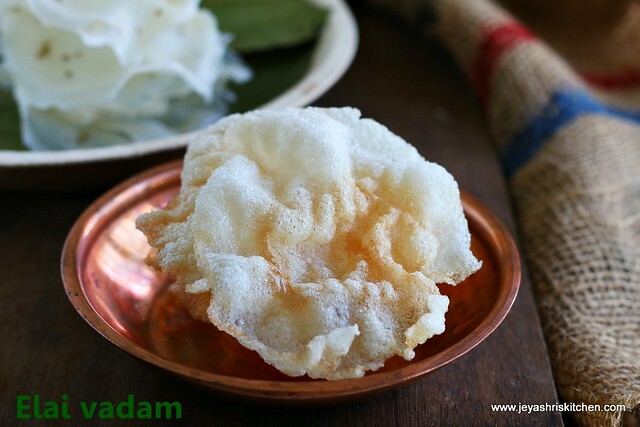 I have already posted the recipe of javarisi vadam, karuvadam and arisi appalam . Though amma doesn't make elai vadam, i love it very much. I got introduced by this vadam,through one of my friend some years back. She sent me some store bought elai vadams and they tasted the same as the Delhi appalams we get in exhibitons. This year i wanted to try elai vadams on my own and finally our tenant aunty India who hails from palakad, told me the recipe and i tried at home 2 days back. It turned out very well. This can be done in places where you don't have terrace and get sunlight only through windows. This vadam doesn't require direct hot sunlight. Soak the idli rice , raw rice and sago in water for 5 hours. Drain the water and grind it into a very smooth paste . Ensure that the batter is very smooth. You can grind this in a grinder too. Since it is in small quantity, i used mixie. Once it is ground nicely add salt, asafoetida, cumin seeds and omam to this. Mix it well and allow this to ferment for 2 hours. This is optional. You can start making it directly too. Some people ferment for 12 hours and make too. Since aunty told me to do like this, i just followed the method. After 2 hours, mix the batter well and ensure the consistency should be like dosa batter. Add water in a idli pan and keep a small cup filled with water inside. Keep a banana leaf on a plate, which should fit into the pan. Add a ladle of batter on this. Do not grease the leaf. Spread it in a circular motion like a dosa. Generally this is called as "ezhudardu" in tamil, which means "writing" on the leaf. Steam this for a few seconds, it takes roughly 30-40 seconds for the batter to get steamed. Now a days we get ilai vadam stand in leading stores in tamilnadu. When it is warm slowly peel it off, it will come out easily. Spread a clean white dhoti or a newspaper or a plastic sheet, in a place where you get some sunlight in your house. Do it for the rest of the batter. Leave it overnight. I finished around 12 pm in the noon and the next day morning it was completely dry. Before going to sleep it just flipped it once. If you are drying it under direct sun in open terrace, it will get dried in 2 hours. Store it in a airtight dry container. Whenever you want you can deep fry them in oil and enjoy with any rice of your choice. This can be kept even for a year if handled properly. Whenever you want to have , fry it and eat. This can be had as a tea time snack. You can sprinkle some red chili powder and have it too. Ensure the consistency of the batter should not be too thin. If it is too thin, it will run out from the leaf. Ensure that the batter is ground too soft without any grains. Slightly grainy too will end up in hard vadams. Do not grease the leaf, if it is greased you can make it like a dosa. Some people add green chilis while grinding, if you want you can do that. Some people used to have the steamed ilai vadam as a tiffin too. Some spicy gravy will go with that. 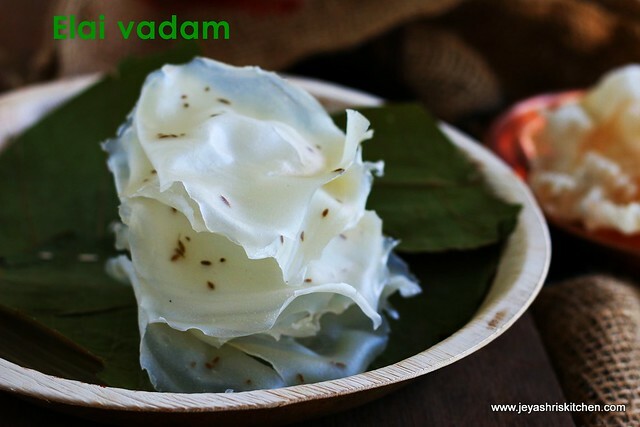 Technorati Tags: elai vadam recipe,how to make elai vadam at home,elai vadam with step wise pictures,home made vadams,summer special recipes,how to make vadam,jeyashris kitchen,traditional recipes. Super!! traditional & yummy dish !!! Well explained. Have to try this once. Wow!!! Looks interesting and easy too. Will surely try this. Hi Jeyashri, I tried it and it turned out perfect !!!.. Thanks for the recipe. Thanks a lot for the recipe.. I love this but my mom forgot the recipe n steps too..ur recipe s of very big help.. going to try sooner.. remembers me of my childhood days.. if I think of it, tastes s still there in d mouth..thanks again..
What to do if there are no bananna leaves???? Sorry couldn't make without banana leaves. I'm in US. I've actually tried it directly on a flat stainless steel plate as well. When using the plate directly, you need a little patience when peeling. The ilia vadam stand that I bought eventually is stainless steel. So, I'm sure if you've flat steel plate, it works well.